Colour: Intense ruby red, tending to garnet with age. Nose: Fine, fruity, dried plum, sour cherry, cocoa, tobacco, sweet spices. Flavour: Rich, soft, quite tasty, warm, soft tannins, very intense, very long and pleasant finish. Serving Suggestions: Grilled red meat, roasts, game, aged cheeses. 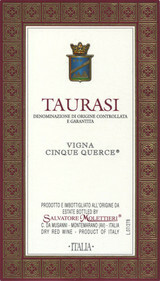 Elegant and toned, the 2008 Taurasi Vigna Cinque Querce is a true gentleman among the unruly group of personalities that make up the Taurasi appellation. This is a standout expression that delivers an enormous sense of balance that is difficult to achieve with a grape that puts so much emphasis on tannins and structure. You get firmness at the back, but Cinque Querce is also supple and smooth in texture. The wine shows great length and purity. If you love Aglianico, don't miss this wine.